1. Park's madien name was Rosa Louise McCauley. 2. Her father was a carpenter and her mother was a teacher. 3. Parks was a life-long member of the African Methodist Episcopal Church. 4. She was of African-American, Cherokee-Creek, and Scots-Irish ancestory. 5. Parks dropped out of high school because her grandmother and mother became ill. She earned her high school diploma after she married Raymond. 6. Quote from Montgomery Police Department Report: "We received a call upon the arrival the bus operator said he had a colored female sitting in the white section of the bus, and would not move back. We (Day & Nixon) also saw her." 7. 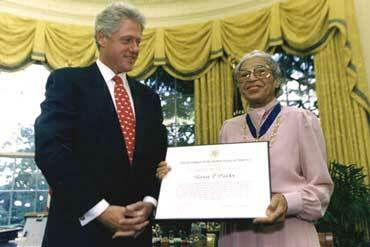 Parks received many awards including The Spingarn Medal in 1979, the Presidential Medal of Freedom in 1996, and the Congressional Medal of Freedom in 1999. 8. A statue of Rosa Parks is in the United States Capitol's National Statuary Hall. 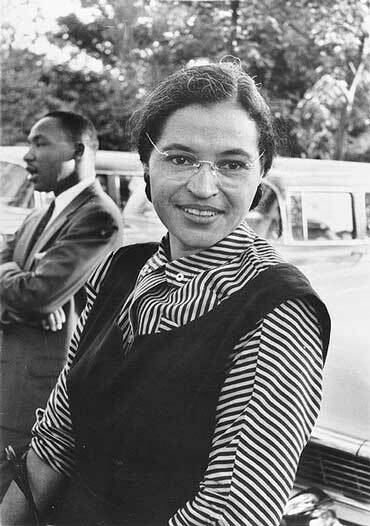 Rosa Parks was an African American civil rights activist. The United States Congress called her the Mother of the Modern Civil Rights Movement. Parks was born on February 4, 1913, in Tuskegee, Alabama. She is famous for not giving up her seat on a bus to a white man. Parks's action led to the Montgomery Bus Boycott, which lasted for over a year. During the Montgomery Bus Boycott, African Americans refused to ride the city buses. This caused the bus system to lose money. In the end, the Supreme Court ruled that Alabama and Montgomery's bus segregation laws were unconstitutional. Parks parents separated when she was young, and she lived on a farm with her mother, younger brother, and her maternal grandparents. She went to a rural school until she was eleven and then she attended the private Montgomery Industrial School for Girls. In 1932, she married Raymond Parks, a self-educated African American. He encouraged his wife to return to school to get her high school diploma. Raymond and Rosa were members of the National Association for the Advancement of Colored People. Rosa was a secretary and a youth leader in the organization. Congressman John Conyers of Michigan employed Mrs. Parks from 1965 to 1988. In February, 1987, she co-founded the Rosa and Raymond Parks Institute for Self Development with Ms. Elaine Eason Steele. Rosa Parks died on October 25, 2005. She was the first woman to lie in honor in the U.S. Capitol Rotunda. 1. Who was Rosa Parks? 2. When was she born? 3. Why was she arrested? 4. How long did the Montgomery Bus Boycott last? 5. What organization did Rosa Parks start in 1995? Copyrights to the pictures and photos on this ESL/EL Civics website belong to individual photographers. We have purchased the rights to use them. Do not copy the photos on this site. Permission is granted to copy any of the worksheets for classroom use. Permission is granted to link to any page of this website. Contact Christina Niven, ESL teacher, at christina@elcivics.com. Please send corrections, comments, greetings, and requests for new photo tours, lessons, and civics units. Copyright © Christina Niven, 2007.